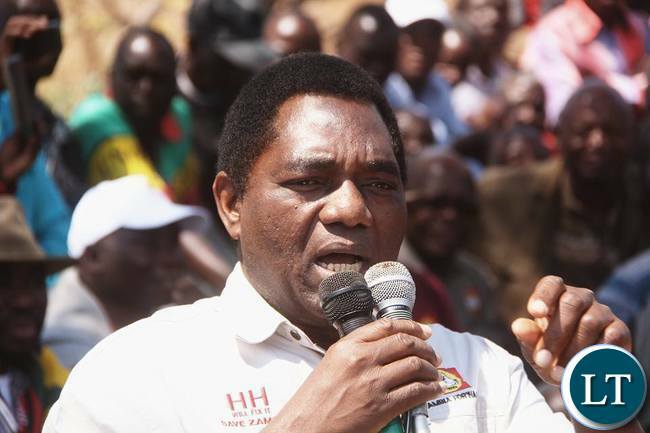 UPND leader Hakainde Hichilema has called for the immediate resignation of the Inspector General of Police Kakoma Kanganja for arresting and detaining citizens who are protesting against the corruption and injustices led by President Edgar Lungu. “I am advising Kakoma Kanganja to resign on his own for stopping, arresting and detaining citizens who are protesting against the broad day light corruption of the PF and it’s leaders especially Mr Edgar Lungu and his associates,” said Mr. Hichilema. Mr. Hichilema stated that the arrest and detaining of citizens under the orders of the Inspector General of Police is a clear indication that he too, like Mr Edgar Lungu is a beneficiary of corruption. The UPND leader stated that the protests were lawfully intended but that the Police as usual obeyed political calls from the PF at the expense of stopping corruption in the country. Mr. Hichilema has also warned the Inspector General of Police to stop playing politics and siding with lawlessness because doing so would make citizens lose confidence in the police. “Kanganja must take note that he has for sometime now been an architect of lawlessness in the country and he is in that office, being paid by Zambians not PF, so when citizens demand answers they must be allowed to do but really Kanganja is trying hard to prove that he is part of lawlessness and citizens will teach him a lesson,” Mr. Hichilema said. And Mr. Hichilema has sympathized with the people who were arrested yesterday for lawfully intending to express their displeasure about the continued corruption and theft under the PF leadership. “I sympathise with my sister Laura, my brother and Musician Chama Fumbe also known as Pilato, my brother Lewis Mwape, my sister Mwambanzi and others who were unlawfully arrested, detained and charged yesterday for simply demanding answers from Mr Edgar Lungu and his PF, please remain strong,” said Mr. Hichilema. He charges that if not careful, the Inspector General of Police will go down togther with the PF and it’s leaders over corruption and several injustices on citizens. And Mr. Hichilema has called on the Inspector General of Police to with immediate effect drop the charges against citizens who were arrested and detained yesterday for standing up against the Patriotic Front party’s corruption on grounds that taking such matters before the court law is mere abuse. “And I am calling on Kakoma Kanganja to drop these charges on citizens with immediate effect because not doing so will again prove that the Police are working hand in hand with the PF to suppress citizens but also abuse court time, and Kanganja does not learn especially that he, himself has been dragged to court before,” added Mr. Hichilema. The UPND leader also reaffirmed that it is because of such irresponsible conduct by the Police and it’s command that the country should take keen interest and help restore normalcy. And Mr. Hichilema has wondered that for how long will citizens be stopped from enjoying their fundamental human rights if the Police is in forefront abrogating the laws. He however appeals to the nation not to sit idle when those claiming leadership are stealing with impunity and seemingly state institutions are there defending ills such as corruption. Mr Hichilema emphasised that suppressing citizens, stealing from citizens and deliberately breaking the laws as is the case now must be stoped and amputed together with the PF and it’s leaders. This is according to a news statement issued by Mr Hichilema’s Deputy Press Secretary Brian Mwiinga. Meanwhile, opposition PeP President Sean Tembo who was arrested on Friday along with five others has vowed to continue seeking answers over the procurement of fire tenders. Mr Tembo has since thanked Zambians for the warm wishes during his incarceration. ” I wish to thank you all Zambians for your warm wishes during my unlawful incarceration following our lawful protest at Parliament yesterday over the $42 million fire tender scandal. Me and my colleagues, Laura Miti, Pilato, Lewis Mwape, Bonwell Mwewa and Mika are extremely grateful to all citizens and we hope that you shall continue to stand on the side of accountability and patriotism, even as we move forward, Mr Tembo said. Mr Tembo said the Patriots for Economic Progress’s quest for justice to prevail on the issue remains unwavering and is just starting. “We intend to pursue this matter all the way to its logical conclusion. In this regard, we shall this week be writing to President Lungu to follow up on modalities for our commissioned forensic audit in this matter,” Mr Tembo said. And Musician Pilato has also thanked the public for the support rendered. Meanwhile, Laura Miti also thanked Zambians for the outpouring of support. The country has moved on from the tender. Grow up ! MWALI LEGAL STUDIES IN PRISONI? Be reminded that every time you take to the streets defying police orders, you are inviting jail. The moment the unruly portions of public start running battles with police on the street, just know that those lawless creatures are ignorant and are just being used by extremely selfish individuals. IG Kakoma is on right track. Equal to the task. Thanks IG for the good job; Merci beaucoup pour votre service inébranlable. Twalumba! KAMBWILI IS MAKING MORE SENSE ……..!!!!!!!!!!!!!!!!!!!!!!!!!! the Halpha and Homega (HH) of UPND has spoken. This time I agree with him. Kakoma Kanganja must go! There’s a difference between Parliament and National Assembly, Yes? Chishimba Kambwili makes more sense than “cuundu chaitwa” chairman HH!! Plus have you seen what i told you yesterday that Laura Miti,Pilato and 3 others were sent to protest by HH’s upnd?if you check from those arrested,no tonga or a bantustan was there to show that its those from PF strongholds who are protesting!! CURSED IS THE DAY HH WAS RELEASED FROM MUKOBEKO! !HE WAS SUPPOSE TO REMAIN THERE BEYOND 2021.HH ONLY WISHES ZAMBIA TROUBLE AS LONG AS ITS NOT HIM IN STATE HOUSE.soon all good economical things our country gained when he was in jail will go bad.i.e kwacha is already losing ground,fuel,mealie meal prices may go up,etc.SURELY,WHY SHOULD WE ALL SUFFER BECAUSE OF ONE KAINDE?GOVNT PLEASE CAGE THIS WOUNDED LION BEFORE WE DO IT FOR YOU!! UBUPUBA BWALI KUCHINFYA, YOU ARE OVERWHELMED BY STUPIDITY. YOU THINK ZAMBIA NI FARM YAKWA NOKO. Look at the name of HH’s press secretary “BRIAN MWIINGA-tonga!! !”.Now remember all those found at his chalala house who were charged with him on 10th April,2017-all tonga. THESE ARE CLEAR SIGNS THAT HH CAN ONLY LEAD A GOVNT BY THE TONGAS AND FOR THE TONGAS AND NOT ZAMBIANS!! !TRIBAL1SM IN HH’S BLOOD!! please brethren in 6.5 provinces never make a mistake of voting for Kainde in 2021.you better even vote for Kambwili,Kabimba,Nawakwi and anothers if not PF!! !HH’S TRIBAL1SM IS IN BLACK AND WHITE (CLEARLY STATED)!!! HH is week in,week out in tongaland.as i speak now,today he was in monze at Gonde educating his tribesmen how to vote for him in 2021.SINCE 11/08/2016 HAVE YOU HEARD OR SEEN HH IN LUAPULA,NORTHERN,MUCHINGA,EASTERN?BIG NO.WHY?BECAUSE YOU PEOPLE THERE DO NOT MATTER TO HIM!! That Mrs Scotland must be ashamed of herself as she was deceived by HH just to secure his freedom from mukobeko.am pretty sure HH still cheats people in 3.5 provinces that he is a president of Zambia.THE DPP SHOULD REVOKE THE NOLLE SO THAT HH CAN GO BEHIND BARS ONCE MORE!! I THINK HH HAS BEEN GIVEN A LONGER ROPE TO RE-HANG HIMSELF. HH HAS NEVER BEEN AND WILL NEVER BE A SUITABLE TONGA FOR PRESIDENCE. HH IS TOO DEEPLY EMMERSED IN TRIBALISM AND HE IS FULL OF HATE AND BITTERNESS. I THINK HE NEVER HAD LOVE FROM HIS PARENTS DURING HIS CHILDHOOD. I DON’T LIKE THE THINKING OF THOSE CHAPS WHO WANT TO SELL ZAMBIA TO COLONISERS. HH IS SIMPLY A POLITICAL REJECT AND IT IS HIMSELF TO BLAME FOR ACCEPT A TRIBAL TICKET. “…..And I am calling on Kakoma Kanganja to drop these charges on …….but also abuse court time….” added Mr. Under5. This boy, under5 UP.NDonkeylet, is a ball of contradictions. Just look at the past 12 months, 67% of court cases in Zambia have been under5 abusing the court process and wasting preciius court time. Today he should be teaching Kanganja about court time?!!! …..So if Laura Miti hates Corruption know that she also hates you and Tribalism because it is one and the same thing. You mean up to now under5 you cannot understand why no one in his or her right senses becomes your ally during elections and so you are confined forever to the role of loser? Your political career was damaged beyond repair tye moment you succeed Mazoka as tonga only for UP.ND president……kikikikikikiki… and his language and usage of words is so unimaginative so uninspiring for a president! Did you pass through school under5, or you spent your time at school tribalising and missing the essence of the english language? This is not partisan issue. It is about bad governance which will affect us and our children. Corruption is a cancer in the body politic of our beloved Zambia. Lungu and his fellow criminals must be made to account. We don’t believe in the Fire Tenders costing $1 million. This deal smells of corruption. Both Lungu and Kampyongo must be made to account. Kampyongo is alleged to have received 3 luxury vehicles as a bribe for awarding the supply contract to the contractor.Mr Corruption No.1 needs to clear his name in this corrupt deal. We want zero tolerance to corruption in Zambia. We must stop Lungu and his fellow crooks from destroying our beloved Zambia thru corruption. Icilema: get it in your thick headway; you have no authority to instruct or to suggest anything under the sun about security issues, ok, iwe kachema? He is Zambian and he pays taxes. What’s wrong with you? EVERY ZAMBIAN HAS A RIGHT TO SAY WHAT THEY WANT. You on the other hand don’t have right to say what you just said. Don’t stop Zambians from airing their views! Whereas under5 is trying hard to misinterpret Laura Miti’s protest to look like anti President Lungu, Laura and her colleagues have not said anything of the sort. Their statements after release do not in any way mention or recognise under5 or his fake support…. if I were under5 I would cry, but of course as (UP.N)Donkey he cannot think clearly due to his tribal annointment. Take it from me ba tuumbu ba under5, I repeat, true Zambians think that if Lungu is bad, you are far worse. That is why when it comes to elections, tgey abandon you. Remember how retrenched miners refused to side with you? Oh yes you do because you cried about it that day in Chililabombwe! If this man can go very far away, like become a Namwala Councilor, Zambia will have peace. HH must know it is not Kakoma that is the problem, it is the alpha and Omegas hat are a problem. The Kanganja family was always a family of intergrity and morals, but the poor guy is in a no win position and I really feel sorry for him. We have a very vicious political mafia and they have sucked the blood of morality in every decent Zambian in the civil service, judiciary and even business. Whoever takes from him will face the same problems as long as the powers be don’t embrace morality, justice and all aspects of democracy. Tell me one person within the system who has not been captured? Just look at the hate and venom in the PF kaponya rats above……they all want is a free space to loot and plunder Zambia with no questions asked….stealing and corruption 24/7 Then you speak their language….. I don’t see any love in your posting either. Ever since the much hyped about dialogue process brokered by the Commonwealth started I have been keenly following it. In particular I have been observing the comments made by under5 at various fora and various issues and Patricia’s envoy Gambari. My conclusion as Terrible is tgat the two are singing totally different songs from two completely different hymn books. In simple language the two parties are poles apart, no I don’t mean like north and south poles on earth (there are human beings in between the poles and its easy to discuss with human beings), I mean like north pole on earth and north pole on the planet Jupiter. 2. there is no Cabinet, so for example, the presentation of national budget was illegal and made by an illegal minister of finance even though under5’s MPs attended the illegal speech and will debate it next week. 3. there no judiciary even though under5 takes his petition and other legal matters to Concourt, High Court, Supreme Court, Magistrates Courts, Local Courts, etc. 4. under5’s political organisation the UP.ND)onkeys is illegal because the Registrar of Societies is illegal as an office of an illegal government. The only parties that legal in Zambia are those that recognise the government and by implication all its wings and departments. 5. ACC is illegal because it is appointed by an “illegal” President. Therefore ACC has no mandate or legal status or locus standi to investigate the suspected corruption in the fire tenders, so the investigations that Laura Miti and her colleagues are demanding are illegal in the eyes of under5. By the same token Chishimba Kambwili and others who claim to possess evidence of corruption cannot take that “evidence” to ACC. TIZ too is offside by rejecting the statement by ACC that they had investifated the tender and cleared it, because ACC is an “illegal” entity going by under5. …..Therefore Mukobeko was the correct place of abode for under5 and Patricia made a big blunder by securing his release. But tell her that Zambians have forgiven her because apart from the tiny minority of UP.NDonkeys (the majority of UP.ND members are decent individuals who pove Zambia like Mazoka did), we are a civilised forgiving society. Anyway, coming from a civilised society herself, how would she have known that she was dealing with UP.NDonkeys and not normal members of society? Why UPND did not join he PROTESTS? HH should have led the protests? WHY COMMENT WHEN U NEVER SUPPORTED ? UYOPA ANOTHER TREASON? THEN THIS KA PARTY SPONSORED BY PEP Stores WHY ARE YOU FIGHTING YOUR own brother from EASTERN,,, MA FIRE TENDER NIYANYOKO? *****s leave HH out of this. He is not as dull as yr thief. He reasons better and yes he has a right to comment on corruption. Some of you are so poverty stricken to a point whr u can’t reason properly. For once think straight and know that this money these *****s are stealing is tax payers money. I know you don’t even understand anything on this issue. Stupid *****s.
This almost former convict at it again. he resumed those antiquated antics of putting demands when a decision has already been made to appear that his demands are carrying weight. Under 5. when is he visiting the barbershop? with all the lice in Mukobebeko the man is still doning that Afro? @ Mwila what do you think of selling of mines at lowest price? What transpired? Is not just the same as buying Tender fires at high price? So HH should also tell us why he pick the lowest bidder to buy mines. What do think, corruption at hand. Why did he lowly evaluate the hotel in Livingstone and later bought it? Sun fimo fimo.